Yet another zucchini recipe: zucchini pickles. (No, you won’t have to spend an entire day in the kitchen, steaming up the windows and driving up your air-conditioning bill.) The magic of refrigeration keeps non-heat-processed pickles perfectly preserved for weeks, without the bother of sterilized jars and steaming lids. Fresh, still-crunchy pickles pair nicely with grilled meats, are delicious tucked into sandwiches, and make a cool snack straight from the jar. Place vegetables into the wide-mouth jar; arrange to fit snugly, reversing spears from time to time so that the thick and thin portions are alternately at the top and bottom of the jar. If using onions, ginger, or dill fronds, place them between the packed vegetables (a chopstick is helpful). In a nonreactive saucepan (ie, not metal), bring the vinegar, salt, spices, sugar (if using) to a boil, then remove from heat. Allow to cool slightly, then carefully pour the hot vinegar mixture over the vegetables in the jar. Cover tightly, place in the refrigerator, and allow to steep 2-3 days before sampling. 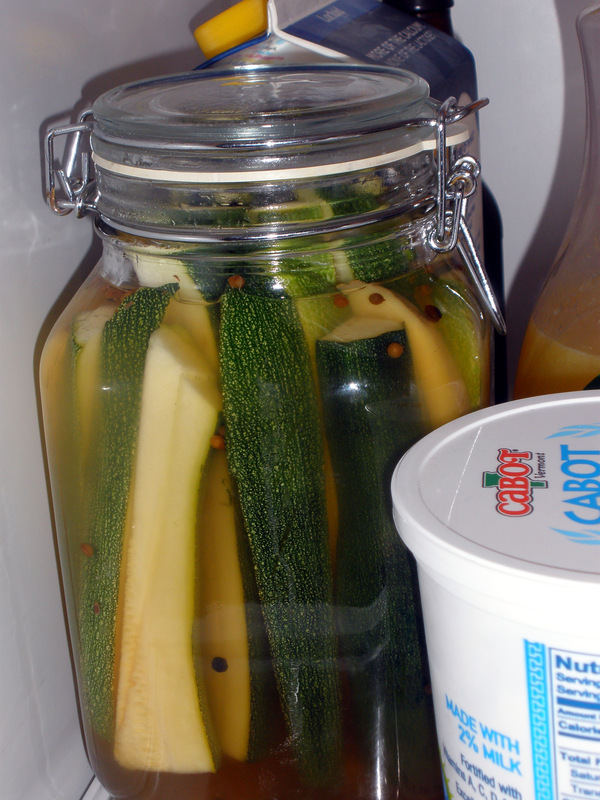 Refrigerated pickles will keep for several weeks. I did add some fresh ginger to each jar; I’m looking forward to eating the pickled ginger as much as the pickled zucchini.